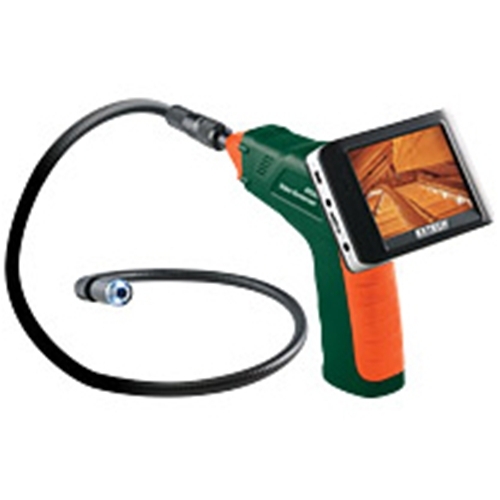 This borescope by Extech Instruments features both video and image capture, to be used during inspection and other job site tasks that physical access may be restricted. An award winning design, this 17 MM camera displays color images and video on a 3.5 inch TFT LCD monitor. The wireless device is detachable, and can be viewed up to 32 feet remotely, from the point of measurement. Images and video captured by the borescope are saved on a memory card (JPEG and AVI) to be viewed on the LCD device screen, or on a desktop or laptop computer. The BR200 has NTSC operation, featuring menus available in 10 different languages. The flexible neck on the borescope is 39 inches in length, and has 2 bright LED built in lights to completely illuminate a dark space. The BR 200 is a waterproof borescope, and is ideal in jobs that involve water clean up or restoration following water breaches, refrigeration and HVAC, automotive, pest control and for electrical inspection applications. View your video or images on the device screen, or Extech includes Micro SD Memory card, adapter for SD, the USB cable to connect to computer for viewing, AC adaptor, and video cable. Also included with the borescope are extension tools, magnetic base and protective storage case. Shop Extech Instruments online at Intech Equipment and Supply for monitoring and water detection tools backed by decades of award winning innovation and design. View full data sheet and user manual below for the BR 200, or browse alternative borescope models – Find the proper tool and eliminate the guesswork during bidding and job site applications. For complete specs please download the product datasheet (note, product data sheets are not available for some accessories).